Courtesy Ghosts of Baltimore – I saw this photo on Pinterest and, at first, I thought it was fake. 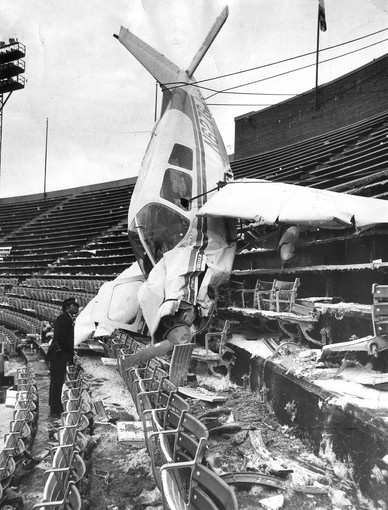 A plane really crashed into Memorial Stadium? This happened on December 19th, 1976 only 10 minutes after a Steelers and Colts game. Pittsburgh had dominated during the game, so fortunately, a large number of fans had left relatively early and nobody was seriously injured. We dug up a story about the crash in The New York Times from December 21st, 1976. 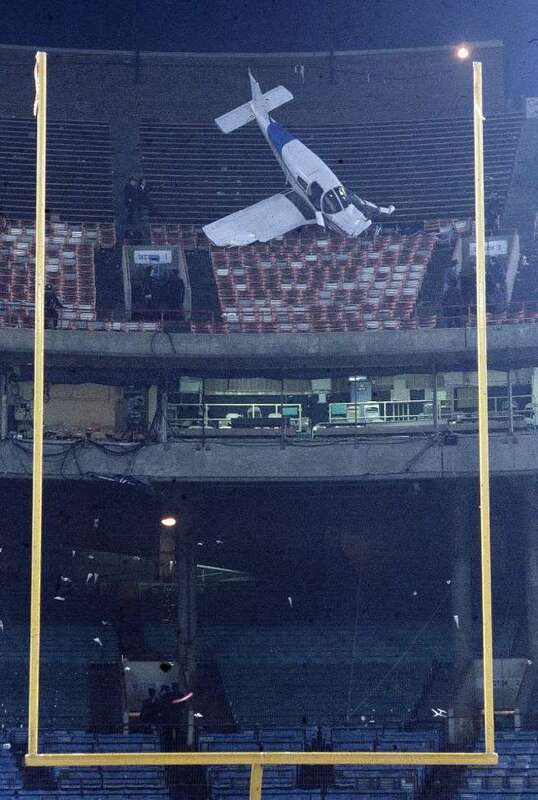 The pilot of a light plane who crashed in the top deck of Baltimore’s Memorial Stadium after Sunday’s playoff football game had been free on $2,100 bond on a previous charge of reckless flying, the authorities said yesterday. For four years before last October, the pilot had been grounded for psychiatric reasons, the authorities said. The 33-year-old pilot, Donald Kroner, was to be arrested today after his expected release from Union Memorial Hospital, where he was treated for cuts, abrasions and chest bruises suffered in the crash of his plane. The Baltimore County police said that Mr. Kroner had been arrested on Dec. 14. He was accused then of reckless flying, littering, and making a bomb threat against a former Baltimore Colt linebacker, Bill Pellington. Mr. Pellington, who retired from the Colts in the late 1960′s, is the proprietor of a restaurant and bar from which Mr. Kroner was once ejected, allegedly for using abusive language. Mr. Kroner retaliated for the ejection, according to the police, by flying over the restaurant and dropping two bottles and a roll of toilet paper. The bomb threats were made by phone, according to the police. Here’s another crazy shot of the airplane. And, here’s an article from The Baltimore Sun twenty years later. Remember it like it was yesterday.